Did you know that if excessive rainwater collects in your gutters, it can cause serious structural damage to your building? From roof leaks to water stains to mold growth, the consequences of poor water drainage can range from trivial to severe. That’s why it’s absolutely essential that you free up your gutters and downspouts so that rainwater can flow away from your house quickly and effectively without pooling in unwanted places. However, that’s much easier said than done. Gutters are a great way to direct rainwater away from your house and foundation, but they sure are a pain to clean. Not only is it tiresome work, but it’s also quite dangerous! Climbing up an unsteady ladder and reaching in all directions while you attempt to remove dirt and dead leaves from your gutters is not a good idea if you’re inexperienced. That’s why Mike’s Window and Gutter Cleaning is pleased to be Kansas City’s premier gutter contractor! Let us worry about the mess in your gutters so you don’t have to. 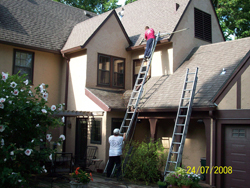 Our complete gutter cleaning services are what you need—so call today! The rain gutter cleaning service from Mike’s Window and Gutter Cleaning involves removing any leaves, twigs, and gunk clogging your gutters and then flushing them out. 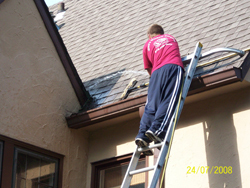 We ensure that water is flowing properly through both the gutters and the downspouts for optimal function. And, because we’re deeply knowledgeable gutter contractors—not just one-dimensional gutter cleaners—we can also perform light gutter repair. As with all of our top-notch services, we’ll never leave a mess in your yard after we’ve finished your gutter cleaning. We bag the debris and haul it away so your yard looks as neat as it did when we arrived! When you need rain gutter cleaning services, Mike’s Window and Gutter Cleaning is ready to bring you clear gutters and excellent customer service at an affordable price. Sit back, relax, and let us be your full-service gutter contractor!